Behold! A gallery of neckware! So close to SRK's Don's pattern-on-pattern look*, yet so much less stupid, even though ordinarily I wouldn't think that paisley on polka-dot-and-different-paisley would work. For more, please visit MissionBAS's ode to Shashi fashion or the true shocking story of his ties. 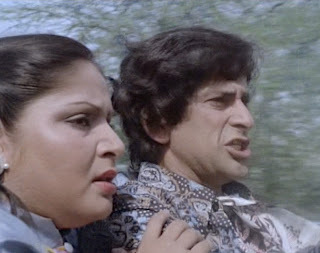 Since I knew Rishi and Shammi first, I never thought I'd have a Kapoor on the FPMBF list. But so it is. 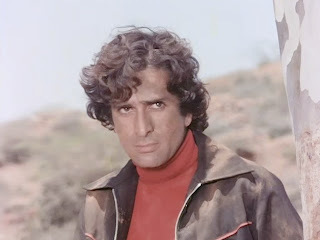 Encouraged by Babasko, Kaddele (who may also be celebrating his birthday, I hear), and Filmi Geek, I officially have a crush on Shashi - alhtough it's historical, since that's how I know him. It's a little bit the eyelashes and a lot the curls, but even more I just think he's really good, even though I've only seen him in three things. 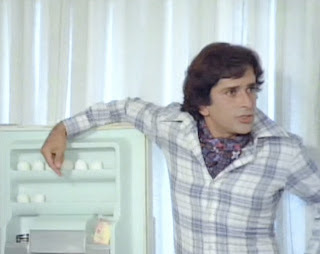 So far I am impressed by his handling the masala lurches from serious to loony, and in Doosra Aadmi his performance is so charasmatic that you can't help but understand why Rakhee blindly searches for someone just like him (even enough to think Rishi somehow fits the cateogry of "just like Shashi," bleh). * Speaking of which, I saw a man on the tube in London wearing a shirt and tie made out of the same pattern. The tie was outside the shirt, though. I love this guy. I really do. Thanks for celebrating his birthday, Beth. Nina - the rules of FPMBF claiming are complex. You officially get to have him as your first choice, but beyond that, we can't regulate - as I was discussing with Filmi Geek, there are only so many high-quality men to go around, so while we must respect each other's "first dibs," after that, there's bound to be overlap. Shashi will only be called up on Aksahye can no longer perform his duties AND Saif and Aamir cannot fill in either. Oopsy, and now for the non-silly comment. Carla, Junoon is on the list, assuming I can get it! And un-bold as I may be in the rest of my life, I can always be relied up on to do something ridiculous if it involves Bollywood. No problemo. Y'know there was this one movie (I forget the name) where he's chasing some random actress over a hill and he stops for a minute, all breathless and says, "But I *love* you...honest!" I should really stop admitting to things like this where other people can read about it. But love, she just does NOT listen to reason. Shashi Kapoor would be my pick too! Dapper! 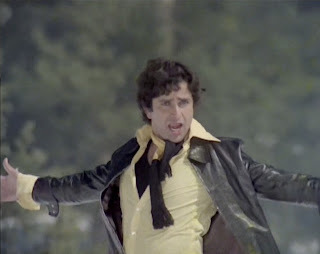 I am trying to recall the name of one of his earliest movies (and failing) which had Om Prakash as the boss-father of future love-interest, and Shashi camps out and then does this dance number...hook line and sinker! I love how much everyone loves Shashi! I had no idea! Does he know he's so beloved? cs - no no, admitting silly things about Indian movie stars is what this site is for. Well, one of the things, anyway - one must not limit oneself. Please remember the name of the movie so I can track it down! 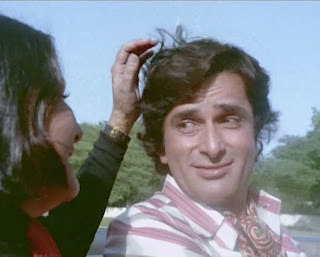 Growing up we all had a huge crush on Shashi, and his rakish smile. We loved watching his films. One of his best is perhaps"Chor Machaye Shor" with Mumtaz...it has some great songs. Then there was that famous one Deewar with Amitabh. He was always nattily dressed and his wife took care of his wardrobe and diet. But, after her death he seems to have changed quite a bit. Sometimes I find it difficult to associate the "now" Shashi with the "old" Shashi.